WHAT IS A PRONG OR CLAW SETTING? When it comes to designing a classic engagement ring like the solitaire, the prong or claw setting is considered to be a popular choice. But what exactly is a prong setting? The best way to identify a prong setting is to have a look at the metal prongs that securely hold the diamond or stone. In this case, a prong setting will have around four to six of these prongs that secure the diamond. In a six or four prong setting, the diamond takes centre stage. The prong setting is a great way to feature the diamond’s brilliance. WHAT IS A HALO SETTING? In a halo setting, the centre diamond is completely encircled by smaller accent diamonds which enhance the centre diamond for a glamorous look. Today, halo diamond ring settings are considered to be one of the most sought-after engagement ring styles. The setting is also a great choice for brides-to-be who want the appearance of a larger diamond. WHAT IS A BEZEL OR TUBE SETTING? A bezel setting features a diamond that is completely or partially surrounded by a thin border of precious metal which holds the diamond securely in place. This setting accentuates the diamond for a contemporary look. For a woman with a more active lifestyle, opt for a bezel setting; this type of setting will protect the diamond’s girdle from being knocked. The channel setting is known to be a fantastic option for wedding bands and diamond anniversary rings and is designed to be more practical for everyday wear. But why exactly is this? The channel setting arranges square diamonds or round brilliant diamonds in a line around the ring using a metal lip on either side of the band. A channel setting features diamonds gracefully suspended between two parallel walls of precious metal for a smooth and elegant look. The diamonds are then nestled in the channel providing more safety for smaller stones. The pavé setting comes from the French word, ‘paved’ referring to the paving of the diamonds on the ring. In this glamorous setting style, diamonds are set closely together for a dazzling diamond-encrusted look. It’s usually a lot of small diamonds that are set together on the ring, giving the overall impression that the diamonds are ‘paved’ along the band. The metal is then formed in a way that it creates tiny beads securing the diamonds in place. The tension setting is designed in a way that the diamond is secured in one position by the pressure of the metal on either side. The metal squeezes the diamond in the middle of the ring holding it in place. With the tension setting the profile of a diamond is visible, making it one of the very few settings where you can see the culet of the diamond. WHAT IS A MICRO SETTING? The micro setting, also known as the micro-prong setting, involves multiple small diamonds that are secured in place by small (micro) prongs. 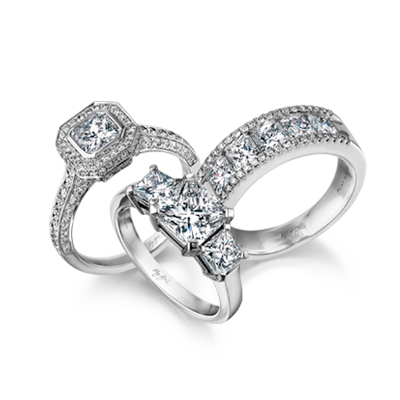 Similar to the pavé setting, micro set diamonds give an encrusted look and add to the overall design of the ring. This style of setting is featured in halo diamond rings and micro set diamond rings. WHAT IS A SWISS OR GYPSY SETTING? The swiss or gypsy setting is often used in the design of a men’s wedding band. This specific type of setting insures that the diamond is placed in the middle of the ring without featuring above the surface. The diamond is then secured with the metals around the perimeter, protecting the diamond’s girdle from being exposed. The swiss setting, in addition, is also very practical for everyday use. Whether you’re looking for a diamond setting that is classic or modern, the option is completely up to you. Visit your nearest Shimansky store to view a variety of spectacular diamond settings to suit your personality and unique style. You will be sure to find an authentic ring that will make you shine!